It was one of Nintendo’s greatest creations and one of the best video games of all time. The Legend of Zelda: A Link to the Past for the Super Nintendo Entertainment System was considered a masterpiece by anyone who had ever played it and many debates occur today to determine whether A Link to the Past or Ocarina of Time was the greatest entry into the franchise. Back in January of 1992, Nintendo published a comic branded off of the Link to the Past video game. It started in Volume 32 of Nintendo Power and ran through December of 1992, ending in Volume 43. The comic loosely followed the game’s story, but to make it more interesting, new characters and twists were added to the story. The comics were created by Japanese mangaka Shotaro Ishinomori. He was best known for the series Cyborg 009, Hotel, and Masked Rider. In 2008, Ishinomori was inducted into the Guinness Book of World Records for holding the most comics published by a single author. He has created 770 stories over 500 volumes of manga! Quite the amazing feat, indeed! 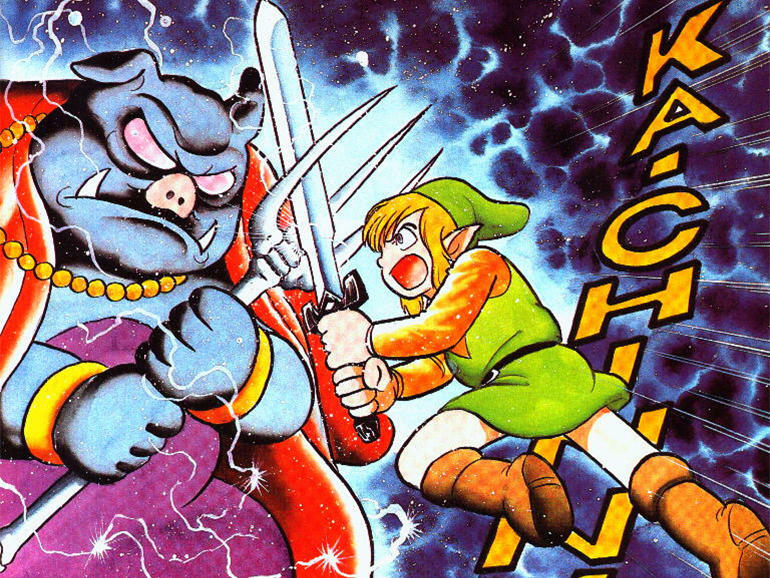 The Legend of Zelda: A Link to the Past was one of those creations and VIZ Media obtained the license and compiled them into a graphic novel. Before I get into the main review, I would like to thank VIZ Media for the review copy they have given me! The story of the graphic novel, as aforementioned, is loosely based around the game. Link is awoken in his home by Princess Zelda’s voice as she calls out to him through telepathy, seeking help. She guides Link to Hyrule castle where he witnesses Agahnim the Wizard defeat his uncle in battle. Link’s uncle bestows upon him his sword and Hylian Shield and tells him to rescue Princess Zelda. Link does so and escapes to Sanctuary where he is told to seek out Sahasrahla the Elder as he will know information about the legendary Master Sword… the sword of evil’s bane! Go, Hero! Rescue the Princess! Link travels to Kakariko Village, but the elder isn’t there. He is sent to the Eastern Palace and is given the Pendant of Courage by Sahasrahla himself. Right away, this is a deviation from the game since we all know Link had to enter the Eastern Palace and defeat the six guards to the pendant’s chamber in order to obtain it. Sahasrahla then tasks Link to find the two remaining pendants. When he returns to Kakariko, the library has been burned down by the soldiers, another deviation from the story, but the librarian is able to save the Book of Mudora which will open the gates to the Desert Palace. Here, they introduce a new plot to cross the desert. Rather than wandering there on foot, the maidens have sewn the feathers of an ancient legendary bird into magical wings. They gave this hang glider to Link and he soared over the sands to the desert. When he used the book, a large statue of a scorpion rises from the sands with the Pendant of Power hanging from its tail. This is different as the Pendant of Power was from the Tower of Hera in the game. Here, Link must travel to Death Mountain, which, in the novel, is adjacent to the Desert. In the Tower of Hera, he ends up fighting a giant spider who held the third pendant within its eye. Link takes the Pendants to the Lost Woods and retrieves the Master Sword. From there, it goes back to following the game by having Link go to Hyrule Castle to battle Agahnim the Wizard. Agahnim sends Zelda into the Dark World, but here, Link kills Agahnim instead of having Agahnim escape! Once we enter the Dark World, the story REALLY gets sped up. They go into detail about the Palace of Darkness, but after that, they only visit the Misery Mire Palace, Ice Palace, and Turtle Rock Dungeon. It is also in the Dark World that we are introduced to a new character exclusive to the graphic novel, Roam. Roam is also of the knight’s bloodline and one of the last people to hold the Master Sword. He was cast into the Dark World and seeks to defeat Ganon by searching for the legendary Silver Arrow. Roam doesn’t believe someone as weak as Link could be the Legendary Hero, but says the day will come where they will need to join forces . He tells Link to try and stay alive until that day comes. Roam can also transform into a bird for both travel and combat. This is explained by the Dark World’s powers to transform people into creatures based on what is in their heart. In the game, you needed the Moon Pearl to stop this from happening, but here in the Graphic Novel, you essentially, just relax your mind and quell the hatred inside of you and you won’t turn into a creature. Link battles his way through the dungeons, learning of Zelda’s whereabouts via the Ice Palace’s floor, which is a map of the Dark World. Link rescues Zelda and now it’s off to Ganon’s Palace – in the novel, it is a giant, floating rock spore rather than the Golden Palace from the game. Link ultimately defeats Ganon and touches the Triforce, restoring The Dark World. We are then taken into a bit of a time skip as Zelda, now Queen, appoints Link as the Head of the Royal Knights. 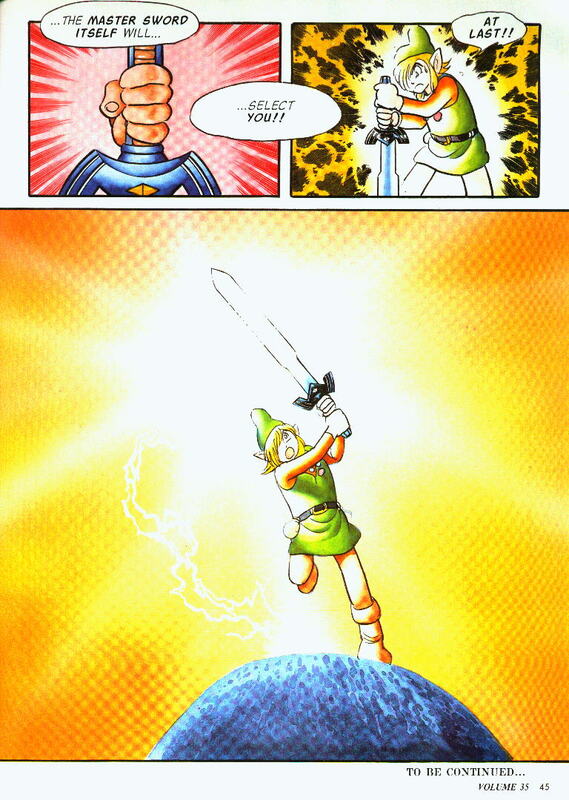 The final page shows The Master Sword covered in moss, sleeping in the Lost Woods, awaiting the time for a new hero to rise and take up its power. The graphic novel was beautifully reproduced by VIZ Media. The art style itself, you can tell, was quite dated, but, again, the source material was from 22 years ago so it’s not going to have the same style as a manga you would read today. This is not a downfall by any means as the artwork was still very well done! If anyone remembers what video game comic adaptations looked like two decades ago, you can pretty much expect the same here. The facial expressions were cartoony in comical situations, but a lot of the pages where explosions or magic were depicted were very highly detailed and some of them looked breathtaking! The art work was printed on 195 pages of 8×10 glossy paper in full color and it really enhanced the overall quality of the graphic novel. It made the artwork have a certain pop to it and it gave it a very vibrant look and feel. The cover is also made of glossy cardstock and the Zelda logo is embossed with a smooth gold foil and red trim… and very nice touch, indeed! I didn’t read the comics in Nintendo Power as a kid, so this was a treat for me! Being exceptionally familiar with the game, I wasn’t reading it to try and compare the stories because that would just be unfair. I went into this seeing what the graphic novel had to offer and I was not disappointed with the exception of the rush job through the Dark World. 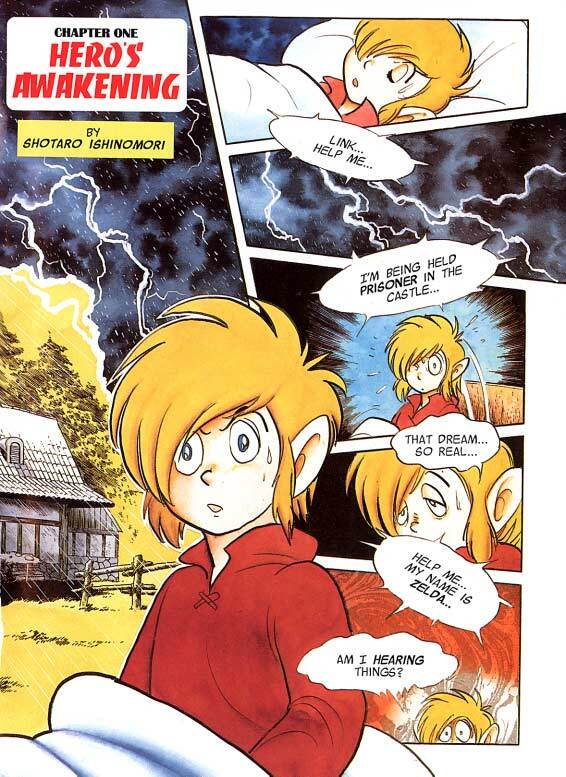 The plot moved very fast and in one instance, Link was in the Ice Palace on one page and on the very same page in the next panel, he was at Turtle Rock. I know that there was limited time and space to work with… it only ran for eleven issues, afterall, but it just seemed like Ishinomori knew that the end was coming so he had to finish it for the sake of finishing it. 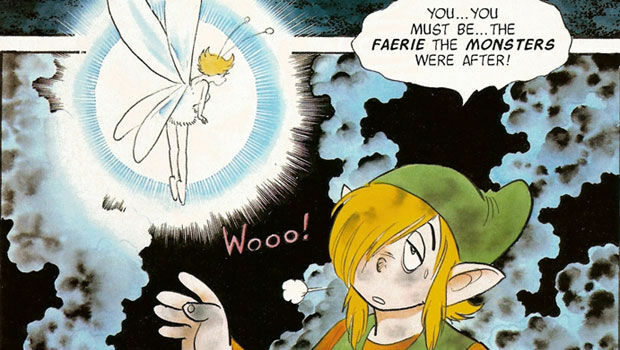 I also liked the addition of a faerie companion for Link. No… it’s not Navi.. and no.. it didn’t spout HEY LISTEN every two seconds. The faerie’s name was Ephemerelda and she was a friend of Zorra. Rather than giving Link flippers, Zorra gave link her faerie to help guide him in his search for Princess Zelda. The two have some pretty comical banter between them and at one point, Ephemerelda gets mad at Link for constantly thinking of Zelda and not her and just ditches him… but because of plot advancement, she’s back by the next chapter anyway. Thank You for Not Being Navi! If you’re a fan of the Zelda series, especially Link to the Past, and you want to take a trip back to a period where things were simpler and fun, then pick up this graphic novel! It will bring out the inner child in you and give you a nice alternate perspective on the game’s story! This is definitely something that belongs in every Zelda fan’s collection… especially if you’re like me and didn’t read the comics when they originally came out. When he transformed into a bird, I wanted to say "Wherever I may Roam"
A very well-done tongue-in-cheek adaptation of one of Nintendo’s greatest video games! Zelda fans won’t be disappointed by this graphic novel!